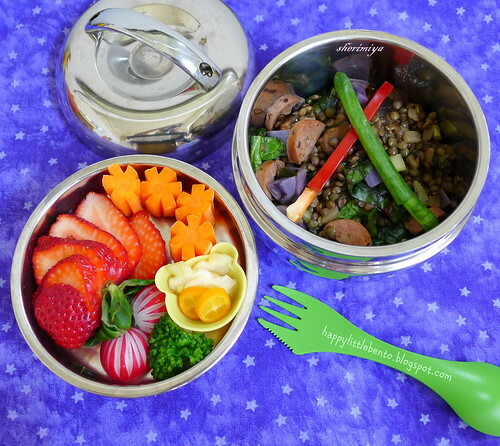 May the 4th Lentil Sausage Bento, a photo by sherimiya ♥ on Flickr. I know it's not May the 4th yet, but since it falls on Saturday this year, I'm sending MisterMan to school with his Star Wars bento today. I tried a new lentil potato sausage chard "salad", which can be served hot or cold. If you want to serve it cold, you can toss with balsamic vinegar or sherry vinegar. I cooked French lentils with diced purple potatoes, then added pan-fried chicken artichoke sausage, mushrooms, onion, garlic and celery. I tossed in shredded chard at the end just to wilt it a little. If you omit the sausage, it could be a vegetarian option. I thought it was pretty good, and refreshing on this hot day. The top tier holds a big strawberry, carrots, fancy-cut radish, broccoli, and pickled turnips and kumquats. Do you see the Star Wars reference? It's very simple, but I hope he gets it. Light sabers were cut from red sweet pepper and cucumber. Happy May the 4th (a few days early)! P.S. You can see the other Star Wars bento I have made in the past here. May the 4th be with you too! That salad sounds good. I never buy chard because I don't know what to do with it. 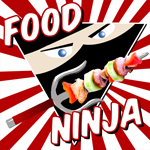 But this sounds pretty tasty, I might try it :) Thanks!